Max Brooks is…The Australian Ironman Champion. Max has kept getting up and pushing himself and the team through injury and bad luck. It is a result that is very well deserved that’s for Sure!! Brilliant result Max, you are the epitome of…’Anything Is Possible!!! Gold, Gold, Gold….. Blake Drysdale Aussies Champ in Flags 3 Years Straight. “Mate I can’t believe it… I’m over the moon, its unreal.. 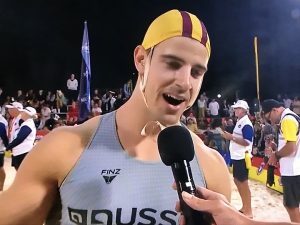 I am just so happy”… says Blake Drysdale as he wins gold in the Open Male Flags for the 3rd year in a row… What an amazing result as Blake used his experience against the younger Sam Zustovich from Mollymook…. Outstanding effort again Blake!!! In an amazing race at North Kirra our U23 Female Boating team made history today…. Becoming the U23 AUSTRALIAN CHAMPS!! This win is the first Australian Gold in Newport history for female boats…. What an outstanding result for Michael King, Abby Ballesty, Meagan Barr, Tara Doyle and Claudia Harris.